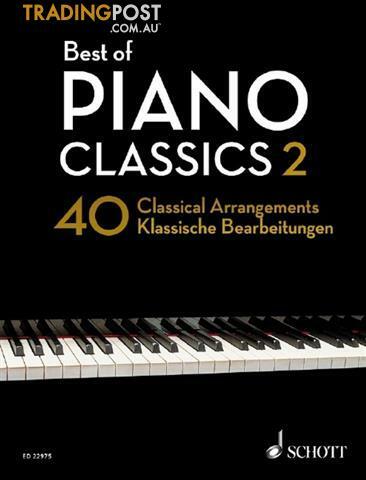 Following the success of the first volume of original compositions for piano in Best of Piano Classics (ED9060), Schott now presents another collection with a selection of 40 arrangements of popular classical masterpieces for the discerning amateur pianist to use over the years.The contents include great works from Bach to Gershwin, ranging from chamber music, symphonies and concertos through to opera. This selection of musical favourites presents the best known and loveliest pieces of classical music from the Baroque era through to the 20th Century, from &apos;Air&apos; to &apos;Rhapsody in Blue&apos;. With fingerings, tempo and pedal suggestions added, these appealing arrangements for advanced players in modern printed scores that are easy to read are recommended not only for tuition purposes, but for all those who enjoy playing the piano in their leisure time..